Ok, so today I have a bit of a Sneak Peek and Detailed Dragonfly cards to share with you. 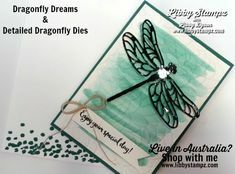 You all know Dragonfly Dreams Photopolymer Stamp Set and the Detailed Dragonfly Thinlits Dies will be retiring on June 3rd, right? Well, they are along with other product. However, before you become too disheartened, we are getting a whole bunch of fantastic new product. 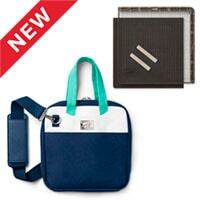 Don’t forget to check out the Last Chance products before placing your order with me. 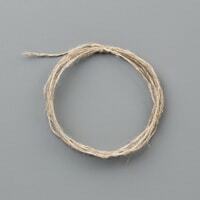 I tied a multiloop bow using Linen Thread finished it with a double knot and rolled up one of the Glue Dots to adhere it to the top of the sentiment piece. Tip: I find a double knot gives the glue dot something to hold onto and lessens the possibility of the bow coming adrift from the card. Use your Aqua Painters to make a wash of ink and water in the lid fo the Tranquil Tide Classic Stampin’ Pad. I love this technique as it’s so easy but quite effective, don’t you think? 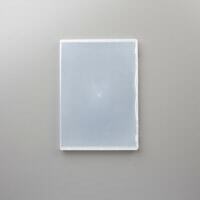 Allow this piece of Shimmery White A4 Card Stock which measures 14.4 cm x 10 cm or 5 1/4″ x 4″ to dry and then run it through the Petal Burst Textured Impressions Embossing Folder. Adhere this to the card front using Liquid Multipurpose Glue. Watch the video for heaps of tips on how to clean and care for your trimmer. Also, some wise shopping tips are shared throughout and there’s a sneak peek of new product in a car we make. Did you give me a thumbs up and subscribe to my YouTube channel? Thank you for your support, I do appreciate it. 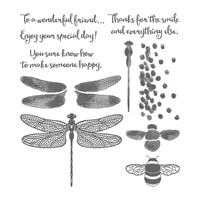 Use Tranquil Tide Classic Stampin’ Pad and one of the images from Dragonfly Dreams Photopolymer Stamp Set to stamp on the card insert and the Whisper White C6 Envelopes. On a scrap of Shimmery White A4 Card Stock and using Tuxedo Black Memento Ink Pad stamp the sentiment from Dragonfly Dreams Photopolymer Stamp Set. 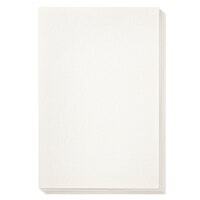 Don’t forget to request your 2019 – 2020 Catalogue from me. (Click the image below). 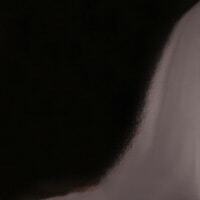 Welcome to my blog again today. I do appreciate you spending time with me. Today I have Dragonfly Dreams Retiring for you. 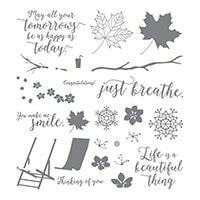 Yes, Dragonfly Dreams Photopolymer Stamp Set and Detailed Dragonfly Thinlits Dies are retiring at the end on May, so if you like them, get them now. So, for the next little while, I will share projects using retiring products with a few sneak peeks thrown in. Don’t forget to request your 2019 – 2020 Catalogue from me. (Click the image below). 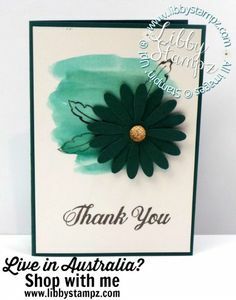 Cut Shimmery White A4 Card Stock to 14.4 cm x 10 cm and make up an ink wash in the lid of the Lemon Lime Twist Classic Stampin’ Pad with your Aqua Painters. Wash over the card front and allow to dry. 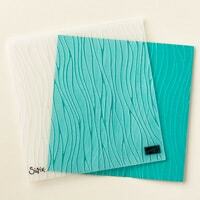 Then run it through with the Seaside Textured Impressions Embossing Folder so the stripes are vertical. 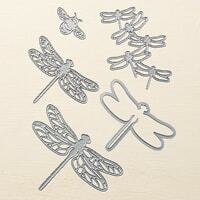 Die cut the dragonflies using Detailed Dragonfly Thinlits Dies and Black Foil Sheets. 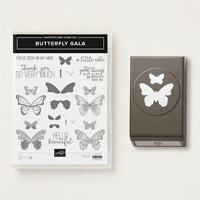 Place some Mini Stampin’ Dimensionals on the dragonfly bodies and adhere them to the card front. Stamp the sentiment from Dragonfly Dreams Photopolymer Stamp Set on a scrap of Shimmery White A4 Card Stock using Tuxedo Black Memento Ink Pad. Trim and banner cut. 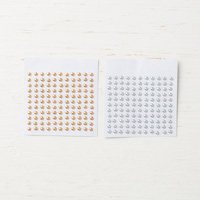 Place some Stampin’ Dimensionals on the back of it and then the Black Mini Sequin Trim. Adhere to the front of the card. Thank you for spending time with me today and visiting my blog. I do appreciate your time. 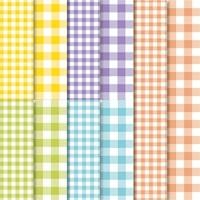 Use Gingham Gala 6″ X 6″ (15.2 X 15.2 Cm) Designer Series Paper and Botanical Butterfly Designer Series Paper cut to10.5 cm x 8 cm or 41/4″ x 31/4″ and adhere them to the front of the card base using Liquid Multipurpose Glue. Die cut a rectangle from Lemon Lime Twist A4 Cardstock using the Rectangle Stitched Framelits Dies. 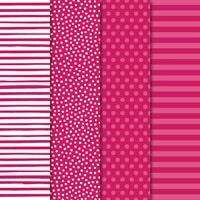 Add some Tear & Tape Adhesive to the back of it and adhere the Organdy Ribbon Combo Pack ribbon. 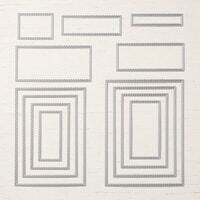 Place Stampin’ Dimensionals on the back of this piece and adhere it to the card front where desired. 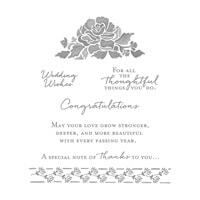 Use Balmy Blue Classic Stampin’ Pad to stamp the sentiment on Whisper White A4 Card Stock and then die cut using the Rose Trellis Thinlits Dies. Oh my goodness, look what I found in my card pile and haven’t shared? 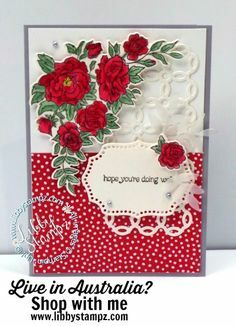 Climbing Roses Well Wishes is the last of my shares using the Climbing Roses Cling Bundle. Welcome to my blog again today. I appreciate you spending time with me. I hope you have a bit of ‘me’ time over the weekend to perhaps create or just relax. 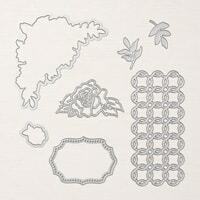 This Climbing Roses Cling Bundle is seriously lovely and has some fantastic elements and sentiments. It’s well worth considering buying it. 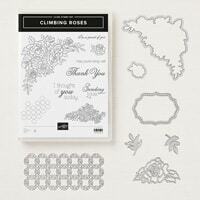 Tip: Buy the Climbing Roses Cling Bundle and save 10%. You actually save $8.75. Bargain! I have a FREE downloadable tutorial for this card at the end of my post. 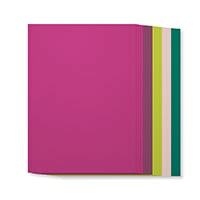 Tip: Use the colours in the In Color 2018–2020 6″ X 6″ (15.2 X 15.2 Cm) Designer Series Paper to make more cards the same but which will look different. 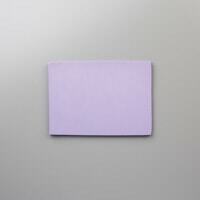 Make sure you always decorate the inside of your card and the Whisper White C6 Envelopes. 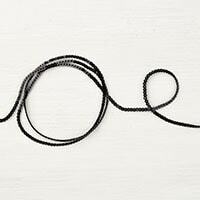 It gives your project a finished look and tells the recipient you cared enough to make it special. Remember, your creativeness is only limited by your imagination. Keep smiling and until next we share. Today sees my final post using the 2017 – 2019 Retiring In Colors with Retiring In Color Daisies in Fresh Fig, Lemon Lime Twist and Berry Burst. Thanks so much for joining me again today. I know you have a busy schedule and I appreciate the time you spend with me each day. Thank You. 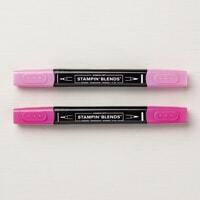 Make a palette of colour by either placing a couple of drops of Ink Refill into the lid of the stamp pad or use a Clear Block A and ink it up from the stamp pad. 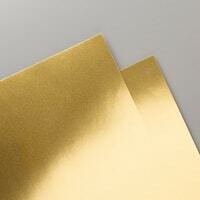 Wash over your Shimmery White A4 Card Stock which is cut to 14.4 cm x 10 cm or 5 1/4″ v 4″. Tip: Have all your card front cut and just clean your Aqua Painters and Clear Block A off on your Stampin’ Scrub in between colours. By having all your card front cut and ready to colour, you can make a number of these cards all in different colours. 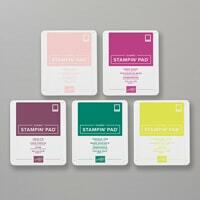 Tip: If you have the In Color 2017–2019 Classic Stampin’ Pad Assortment and like the colours, make sure you buy the Ink Refills so you can reink your ink pads and use them for different techniques. Buy them before they’re gone on May 31 or while stocks last. 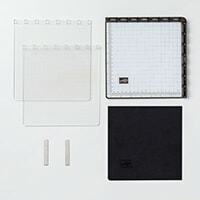 Tip: When using your Stamparatus, clean your stamps using the Simply Shammy and then store your Simply Shammy in a Clear-Mount Stamp Cases. 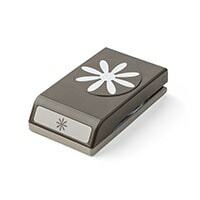 This makes travelling with your Simply Shammy easy as well as easy storage at home. 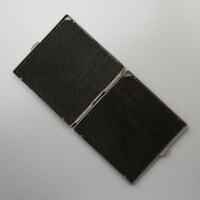 It will keep your Simply Shammy moist for those times when you are constantly stamping and it’s easy to leave the case open to let your Simply Shammy dry out at other times. Welcome back to my blog for more ideas using the 2017 – 2019 Retiring In Colors. Today’s cards, Daisy Thank You, use Powder Pink and Tranquil Tide but not together. Thanks so much for joining me again today and sharing some of your precious time with me. I do appreciate it. 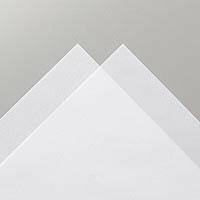 Cut a card insert of Whisper White A4 Card Stock to 13.5 cm x 9.5 cm or 5″ x 3 3/4″ and use the ink pad to stamp the small flower 3 times on the card insert and the Whisper White C6 Envelopes. 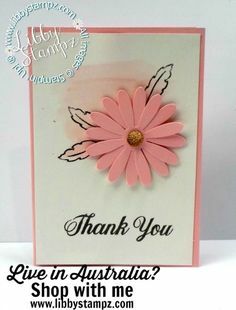 I have a very simple card for you today, Floral Phrases Thanks. I utilised the Stamparatus and the retiring 2017 – 2019 In Colors. Thanks so much for sharing your time with me. I really appreciate it. Tip: Store your Simply Shammy in a Clear-Mount Stamp Cases. They fit nicely and it’s easy to either keep them moist for frequent use or let them dry out between uses and remoisten when needed. 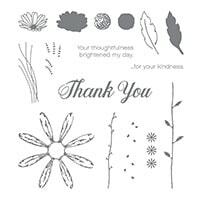 While you have the border stamp from Floral Phrases Clear-Mount Stamp Set, stamp the same image on the card insert which is cut from Whisper White A4 Card Stock to 13.5 cm x 9.5 cm or 5″ x 3 3/4″ and on the Whisper White C6 Envelopes. 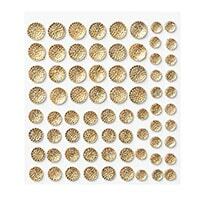 Add Share What You Love Artisan Pearls where desired. Welcome to a new week on my blog. I’m looking at Retiring 2017 – 2019 In Colors this week. I have a coffee card today called Berry Burst Thanks A Latte. Thanks for spending time with me, I really appreciate it. Well, what a fantastic week I’ve had in Auckland, New Zealand attending Stampin’ Up! OnStage and spending a few extra days with friends and exploring. My flight home arrives tonight and whilst it’s lovely to go away, you do appreciate your home comforts, don’t you? 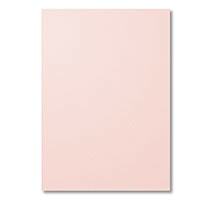 Cut a piece of Watercolor Paper to 14.4 cm x 10 cm or 5 1/4″ x 4″. Tip: Watercolor Paper has a right and wrong side. Feel it and the smoother side is the right side. 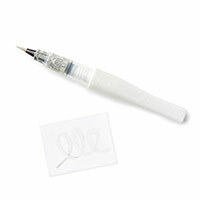 Wipe over the right side of your Watercolor Paper with an Embossing Buddy to remove static and oil from your fingers. Stamp with Versamark Pad using the sentiment image from Coffee Café Photopolymer Stamp Set. I stamped it 3 times. 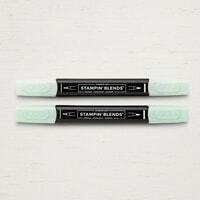 Sprinkle over your stamping with White Stampin’ Emboss Powder and then heat set with your Heat Tool. 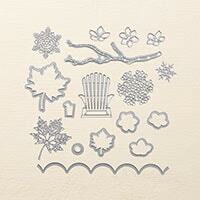 Tip: Always have some copy paper under your work when sprinkling with embossing powder. It will catch any excess and makes tipping this excess back into your container easy. 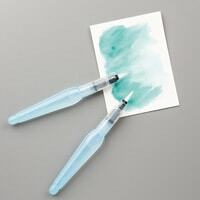 Wipe over the Watercolor Paper in a diagonal fashion, reloading the Aqua Painter with colour as needed. 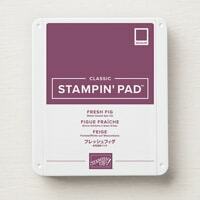 Tip: If you can’t squeeze ink into the lid of the Berry Burst Classic Stampin’ Pad. Use one of your acrylic blocks and dab it on the pad of the Berry Burst Classic Stampin’ Pad, then use it as a palette. 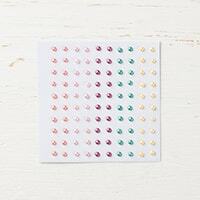 When the Watercolor Paper is dry, use the Berry Burst Classic Stampin’ Pad to stamp the heart images from the Coffee Café Photopolymer Stamp Set. Adhere the completed Watercolor Paper piece to the card front using Liquid Multipurpose Glue. 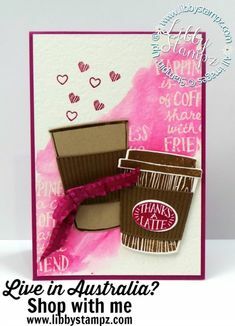 Use Soft Suede Classic Stampin’ Pad to stamp 1 lid and 1 smaller coffee cup from Coffee Café Photopolymer Stamp Set onto Whisper White A4 Card Stock. 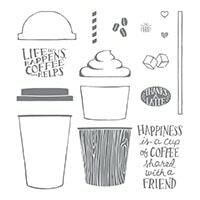 Die cut all the stamped images using the Coffee Cups Framelits Dies and the Big Shot. 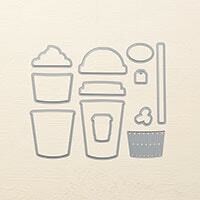 Also, die cut 2 coffee sleeves from Soft Suede A4 Card Stock. Hello and welcome to my blog again today. I do appreciate you spending time with me. Today I want to share with you about the Craft and Carry Stamparatus Bag. 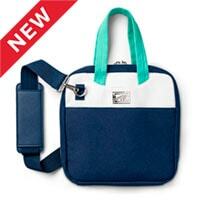 This marvellous bag will carry not just your Stamparatus but lots of tools as well. Place your whole Stamparatus behind the Velcro strap pocket. 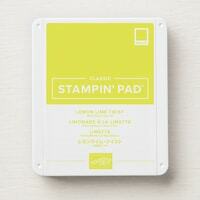 Put your Simply Shammy in a Clear-Mount Stamp Cases into one of the pockets on the opposite side. Add tools or other items in the remaining pocket and zip up. Then there’s another pocket on the outside which will take more equipment or card etc. Or, buy the Craft & Carry Stamparatus® Bag in your Starter Kit and you still have $185 worth of free product to choose in your kit. Thanks so much for stopping by today, I do appreciate you spending time here. Read on for some great tips for your card making and in particular my card today, Seasonal Thanks. I just love the neutral colour palette and this card reminds me so much of Autumn which we’re in the middle of now. 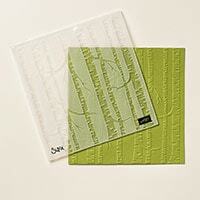 Use a piece of Very Vanilla A4 Card Stock cut to 13.9 cm x 9.5 cm or 5″ x 3 3/4″ and run it through your Big Shot with the Woodland Textured Impressions Embossing Folder. Tip: I like to use Sponge Daubers to add colour to embossed panels as I feel it gives me more control over the colour. 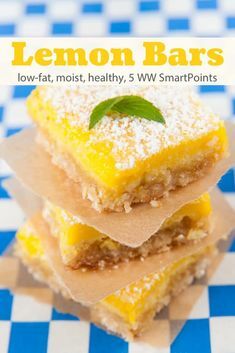 Take a Sponge Daubers and use Crumb Cake Classic Stampin’ Pad to give colour to the embossed panel. Tip: Start by dabbing the colour on the ink pad and then try the colour on scrap paper first then rubbing lightly over the embossed panel until you’re happy with the colour. You can always add colour but you can’t take it off. Stamp some whole leaves from Colorful Seasons Photopolymer Stamp Set on Crumb Cake A4 Card Stock with Crumb Cake Classic Stampin’ Pad. 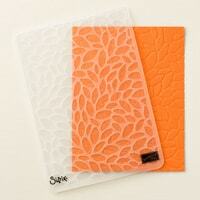 Die cut leaves from Seasonal Layers Thinlits Dies – 3 from Gold Foil Sheets and 2 each from Crumb Cake A4 Card Stock. Tip: Working with an odd number of like elements seems to make your card look more balanced. 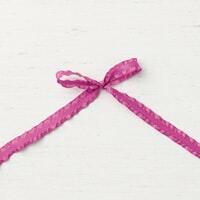 Tie a multiloop bow from Linen Thread and tie a double knot. Tip: Roll a Glue Dots into a ball and place it where you want your bow. Add the bow pressing the double knot into the rolled up Glue Dots. 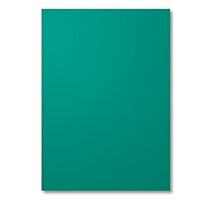 Cut a card base from measuring 21 cm x 14.9 cm or 5 1/2″ x 8 1/2″.